A growing body of knowledge is revealing the critical role of circadian physiology in the development of specific pathological entities such as cancer. NK cell function participates in the immune response against infection and malignancy. We have reported previously the existence of a physiological circadian rhythm of NK cell cytolytic activity in rats, suggesting the existence of circadian mechanisms subjacent to NK cell function. At the cellular level, circadian rhythms are originated by the sustained transcriptional-translational oscillation of clock genes that form the cellular clock apparatus. Our aim in this study was to investigate the presence of molecular clock mechanisms in NK cells as well as the circadian expression of critical factors involved in NK cell function. For that purpose, we measured the circadian changes in the expression of clock genes (Per1, Per2, Bmal1, Clock), Dbp (a clock-controlled output gene), CREB (involved in clock signaling), cytolytic factors (granzyme B and perforin), and cytokines (IFN-γ and TNF-α) in NK cells enriched from the rat spleen. The results obtained from this study demonstrate for the first time the existence of functional molecular clock mechanisms in NK cells. Moreover, the circadian expression of cytolytic factors and cytokines in NK cells reported in this study emphasizes the circadian nature of NK cell function. Circadian rhythms describe biological phenomena that oscillate within a 24-h cycle. These rhythms provide a temporal frame necessary for adequate homeostasis. By anticipating both environmental and internal changes, cells (and organisms) can efficiently program their physiological tasks. At the cellular level, circadian rhythms are originated by genetic elements (clock genes) organized in autoregulatory transcription-translation feedback loops. This oscillating machinery would ultimately generate the circadian rhythms in physiology and behavior. The core molecular clock components are: Per (Per1, Per2, and Per3) and Cry (Cry1 and Cry2) genes, which belong to the so-called negative limb of the clock; together with Clock and Bmal1 genes, which belong to the so-called positive limb of the clock. Downstream of the core clock components, the molecular clock machinery also comprises clock-controlled genes like the transcription factor Dbp, considered to be a direct regulator of clock outputs (1). In addition, other factors such as the Ca2+/CREB protein are being shown to play a central role in the clock molecular mechanism (2, 3). The basic oscillatory mechanism consists in the transcriptional activation of Per and Cry genes by CLOCK/BMAL1 heterodimers. Later accumulation of PER and CRY products suppresses the transcriptional activity driven by CLOCK/BMAL1, closing the feedback loop (4). Circadian oscillators (i.e., circadian rhythms in clock gene expression) have been detected in multiple peripheral tissues such as the heart (5), liver (6), spleen (7), bone marrow (8), endocrine tissues (9), pancreas (10), and others. To our knowledge, this is the first study addressing the existence of circadian oscillators in NK cells. NK cells are a subset of lymphocytes characterized by the lack of CD3-TCR complex (11). NK cells are a critical component of the innate immunity against fungal, bacterial, and viral infections. They also play a vital role in cellular resistance to malignancy and tumor metastasis (12). NK cells can destroy infected and malignant cells by calcium-dependent release of cytolytic granules, by activation of the Fas (CD95) pathway or by TNF-α release (13). Among these mechanisms, the release of cytolytic granules containing granzymes (particularly granzyme B) and of perforin seems to be the major mechanism used for the killing of the target cell (14). Another vital function of NK cells is the production of cytokines such as IFN-γ and TNF-α (15). In addition to its essential role in effector functions against tumor metastases (16), IFN-γ acts as a self-activating molecule for NK cells (17). Similarly, TNF-α promotes NK cell-mediated killing (18). Light and daily rhythms have a profound influence on immune function (19, 20). Many studies have described circadian variations of different immune parameters such as lymphocyte proliferation, Ag presentation, and cytokine gene expression (21). More specifically, previous works have pointed to changes in NK cell activity at different times of the day (22, 23, 24). We have recently published a conclusive study that describes the circadian rhythm in NK cell cytolytic activity in rats (25). Still, the underlying mechanisms governing NK cell circadian function are largely unknown. This uncertainty is not a trivial issue because alterations in circadian rhythms can lead to serious pathologies such as sleep disorders, cardiovascular diseases, depression, and even cancer (26, 27). Furthermore, emerging data in the human and animal literature suggest that circadian regulation may be crucial for the host defenses against cancer (28). Under this perspective, our aim was to investigate the presence of molecular clock mechanisms in NK cells as well as the circadian expression of critical factors involved in NK cell function. For that purpose, we measured the circadian changes in the expression of clock genes (Per1, Per2, Bmal1, and Clock), Dbp (a clock-controlled output gene), CREB (involved in clock signaling), cytolytic factors (granzyme B and perforin), and cytokines (IFN-γ and TNF-α) in NK cells enriched from the rat spleen. Sprague-Dawley male rats at 2 mo of age were maintained under constant environmental conditions on a 12 h light/dark cycle (light period from 7:00 a.m. to 7:00 p.m.) and were fed rodent chow ad libitum. Rats were euthanized by decapitation at 6:00 a.m., 10:00 a.m., 2:00 p.m., 6:00 p.m., 10:00 p.m., and 2:00 a.m. These time points correspond with Zeitgeber times (ZT)3 3, 7, 11, 15, 19, and 23, respectively. Spleens were immediately collected for enrichment of NK cells. Throughout the study, animal care and treatment complied with National Institutes of Health policy, were in accordance with institutional guidelines, and were approved by the Rutgers Animal Care and Facilities Committee. Spleens were individually processed as previously described (29) to obtain homogeneous splenocyte suspensions in RPMI 1640 (Invitrogen Life Technologies). RBCs and granulocytes were separated by centrifugation (30 min at 400 × g) with Histopaque 1083 (Sigma-Aldrich). After washing with RPMI 1640, splenocytes (∼12 × 107 from one spleen) were resuspended in running buffer (PBS, 0.5% BSA). NK cells were then enriched by magnetic separation (negative selection) with an AutoMACS Magnetic Separator (Miltenyi Biotec) after incubating the splenocytes with anti-pan T cell Microbeads (OX52), anti CD45RA Microbeads (for mature B cells), and anti-MHC class II Microbeads (OX6) for dendritic cells and macrophages, following manufacturer’s indications. All Microbeads were purchased from Miltenyi Biotec. The yield in the negative (enriched) fraction was consistently ∼5 × 106 cells per spleen. The purity of the enriched fraction was assessed by flow cytometry using the FITC-conjugated anti-rat CD161a (NKR-P1A) mAb (BD Biosciences) together with appropriate isotypic IgG controls. This enrichment method, which is completed within 60–80 min, consistently yields a purity of ∼70% of untouched NKR-P1A-positive cells. The percentage of CD3- and CD8-positive cells in the NK-enriched fraction was also assessed by flow cytometry with PE-conjugated anti-rat CD3 and anti-rat CD8 mAbs (BD Biosciences) and it was consistently below 3%. Immediately after the separation procedure, enriched NK cells were lysed in appropriate buffers for later RNA extraction and protein analysis. RNA from 2 × 106 enriched NK cells (per spleen) was isolated with the RNeasy mini kit (Qiagen). A 100 ng of total RNA was reverse transcribed to the first strand cDNA using Superscript II First Strand Synthesis System for RT-PCR (Invitrogen Life Technologies). Relative quantitation of mRNA levels was performed by real-time PCR (SYBR Green Assay; Applied Biosystems) using an ABI prism 7700 Sequence Detector. The following primer sequences were used: Per1 sense 5′-CCAGGCCCGGAGAACCTTTTT-3′, antisense 5′-CGAAGTTTGAGCTCCCGAAGT-3′ (10); Per2 sense 5′-GCAGCCTTTCGATTATTCTTC-3′, antisense 5′-GCTCCACGGGTTGATGAAG-3′; Bmal1 sense 5′-TCCGATGACGAACTGAAACAC-3′, antisense 5′-CTCGGTCACATCCTACGACAA-3′; Clock sense 5′-GAACTTGGCGTTGAGGAGTCT-3′, antisense 5′-GTGATCGAACCTTTCCAGTGC-3′; Dbp sense 5′-AGGCAAGGAAAGTCCAGGTG-3′, antisense 5′-TCTTGCGTCTCTCGACCTCTT-3′ (5); CREB sense 5′-ACTCAGCCGGGTACTACCATTCT-3′, antisense 5′-GGTGCTGTGCGAATCTGGTAT-3′; granzyme B sense 5′-CGTGCATCAGAAGTGGGTGTTG-3′, antisense 5′-GAGGCTGTTGTTACACATCCGG-3′; perforin sense 5′-GCATCGGTGCCCAAGCCAGTG-3′, antisense 5′-GCCAGCGAGCCCCTGCTCATCA-3′; IFN-γ sense 5′-AGAGCCTCCTCTTGGATATCTGG-3′, antisense 5′-GCTTCCTTAGGCTAGATTCTGGTG-3′ (30); TNF-α sense 5′-CCAGGTTCTCTTCAAGGGACAA-3′, antisense 5′-CTCCTGCTATGAAATGGCAAATC-3′ (31). Analyses were performed using the standard curve method with GAPDH (rodent GAPDH primers; Applied Biosystems) as the normalizing endogenous control. Relative mRNA levels at each time point were calculated as the percentage of the maximum value over the 24-h period. For protein analysis, 2 × 106 enriched NK cells (per spleen) were subjected to standard SDS-PAGE electrophoresis, and proteins were transferred to polyvinylidene difluoride membranes following usual procedures. Blots were probed with granzyme B mAb (BD Biosciences), perforin polyclonal Ab (Torrey Pines Biolabs), IFN-γ polyclonal Ab (Chemicon International), TNF-α polyclonal Ab (Chemicon International), phospho-CREB polyclonal Ab (Upstate Biotechnology) and mAb (Oncogene Research Products) for normalizing purposes. After chemiluminiscence detection (ECL Plus; Amersham), densitometric analyses were performed using Scion Image software. Relative protein levels were calculated as a percentage of the maximum value observed in each blot. One-way ANOVA with the Newman-Keuls posttest was used to assess differences between means at different time points. A value of p < 0.05 was considered statistically significant. We first investigated the presence of canonical components of the cellular clock in NK cells. RT-PCR analysis revealed that both negative (Per1 and Per2) and positive (Bmal1 and Clock) components of the molecular clock are expressed in enriched NK cells and in the rat NK cell line RNK16 (Fig. 1⇓). As a control, clock gene expression was codetected in the suprachiasmatic nuclei (SCN) and the spleen. Canonical clock genes are expressed in enriched NK cells and in the RNK16 cell line. RT-PCR bands (arrows) corresponding to rat clock genes Per1, Per2, Bmal1, and Clock. Detection of clock gene expression in the SCN and in the spleen served as positive control. DNA mass ladder (left lane) is shown, together with the negative control (no reverse transcription). Our second aim was to know whether splenic NK cells present clock gene oscillations in vivo. For that purpose, we performed relative quantitation of clock genes mRNA by real-time PCR in enriched splenic NK cells obtained at different time points. Per1 mRNA levels peaked at ZT11 and were minimum from ZT23 to ZT7 (p < 0.05; Fig. 2⇓A). Per2 mRNA levels were found to be lowest at ZT23, and were consistently high from ZT11 to ZT15 (p < 0.05; Fig. 2⇓B). The mRNA oscillations of the positive clock genes Bmal1 and Clock were very similar, showing two maxima at ZT3 and ZT7, and steady low levels from ZT11 to ZT23 (p < 0.05; Fig. 2⇓, C and D). These time points coincided with rising mRNA levels of Per1 and Per2, their negative counterparts in the molecular clock. Dbp, a clock-controlled transcription factor, also presented circadian oscillations in mRNA levels, which peaked at ZT11 and were minimum from ZT19 to ZT23 (p < 0.05; Fig. 2⇓E). Canonical clock genes oscillate in enriched NK cells. Circadian rhythms in mRNA levels of Per1 (A), Per2 (B), Bmal1 (C), Clock (D), and Dbp (C) detected in NK cells enriched from rat spleen at 6:00 a.m., 10:00 a.m., 2:00 p.m., 6:00 p.m., 10:00 p.m., and 2:00 a.m. These time points correspond with ZT 3, 7, 11, 15, 19, and 23, respectively. Total RNA from the enriched fraction was reverse transcribed to cDNA and then subjected to real-time PCR. Relative mRNA levels at each time point were determined as a percentage of the maximum value. Data are mean ± SEM of four animals per time point. a, Significantly different (p at least <0.05) from the lowest value; b, significantly different (p at least <0.05) from the second lowest value; c, significantly different (p at least <0.05) from the third lowest value. The dark period (▪) in the cycle is shown. If the cellular clock is somehow involved in NK cell function it would be expected to see circadian oscillations in the expression of cytolytic factors and cytokines produced by these lymphocytes. To investigate this possibility, we performed relative mRNA quantitation of granzyme B, perforin, IFN-γ, and TNF-α by real-time PCR in enriched splenic NK cells obtained at different time points. Circadian oscillations of transcripts levels were found in all the mentioned factors. Granzyme B mRNA levels peaked at ZT7 (p < 0.05; Fig. 3⇓A), perforin mRNA presented maximum levels from ZT3 to ZT7 (p < 0.05; Fig. 3⇓B), IFN-γ mRNA levels showed steady high levels from ZT3 to ZT11 (p < 0.05; Fig. 3⇓C), and TNF-α mRNA levels peaked at ZT7 (p < 0.05; Fig. 3⇓D). Interestingly, the circadian rhythms in mRNA levels of these four factors were coordinated, showing high levels at the beginning of the light phase (ZT3-ZT7) and low levels during the dark phase. mRNA levels of cytolytic factors and cytokines show circadian oscillations in enriched NK cells. Circadian rhythms in mRNA levels of granzyme B (A), perforin (B), IFN-γ (C), and TNF-α (D) detected in NK cells enriched from rat spleen at 6:00 a.m., 10:00 a.m., 2:00 p.m., 6:00 p.m., 10:00 p.m., and 2:00 a.m. These time points correspond with ZT 3, 7, 11, 15, 19, and 23, respectively. Total RNA from the enriched fraction was reverse transcribed to cDNA and then subjected to real-time PCR. Relative mRNA levels at each time point were determined as a percentage of the maximum value. Data are mean ± SEM of four animals per time point. a, Significantly different (p at least <0.05) from the lowest value. The dark period (▪) in cycle is shown. We also examined whether the circadian variations in the mRNA of cytolytic factors and cytokines were translated to oscillations in their protein levels. Enriched NK cells presented circadian oscillations in the protein levels of granzyme B, perforin, IFN-γ, and TNF-α. Granzyme B protein levels peaked at ZT19 (p < 0.05; Fig. 4⇓A), perforin protein presented maximum levels from ZT19 to Z23 (p < 0.05; Fig. 4⇓B), IFN-γ protein levels also showed two maxima at ZT19 and ZT23 (p < 0.05; Fig. 4⇓C), and TNF-α protein levels peaked at ZT15 (p < 0.05; Fig. 4⇓D). Similarly to mRNA oscillations, the circadian rhythms in protein levels of these four factors were also coordinated, showing high levels during the dark phase and low levels during the light phase. It is worth noting that the rhythms in protein levels of cytolytic factors and cytokines run in antiphase to those of mRNA levels. Furthermore, granzyme B, perforin, and IFN-γ all showed a significant peak in protein levels at ZT19, exactly when the peak in NK cell cytolytic activity has been reported (25). Protein levels of cytolytic factors and cytokines show circadian oscillations in enriched NK cells. Circadian rhythms in protein levels of granzyme B (A), perforin (B), IFN-γ (C), and TNF-α (D) detected in NK cells enriched from rat spleen at 6:00 a.m., 10:00 a.m., 2:00 p.m., 6:00 p.m., 10:00 p.m., and 2:00 a.m. These time points correspond with ZT 3, 7, 11, 15, 19, and 23, respectively. Enriched fraction lysates were subjected to standard SDS-PAGE electrophoresis and blotting procedures. After densitometric quantitation, relative protein content at each time point was determined as a percentage of the maximum value. Data are mean ± SEM of four animals per time point. a, Significantly different (p at least <0.05) from the lowest value. The dark period (▪) in the cycle is shown. Representative immunoblots are shown. As suggested, the cAMP response element (CRE)/CREB pathway appears to be involved in the clock molecular mechanism. Although there were no significant circadian variations in CREB mRNA levels in enriched NK cells (p > 0.05; Fig. 5⇓A), we found a significant peak in phosphorylated CREB levels at ZT7 (p < 0.05; Fig. 5⇓B). Interestingly enough, phosphorylated CREB peak coincides with maximum mRNA levels of granzyme B, perforin, IFN-γ, and TNF-α. 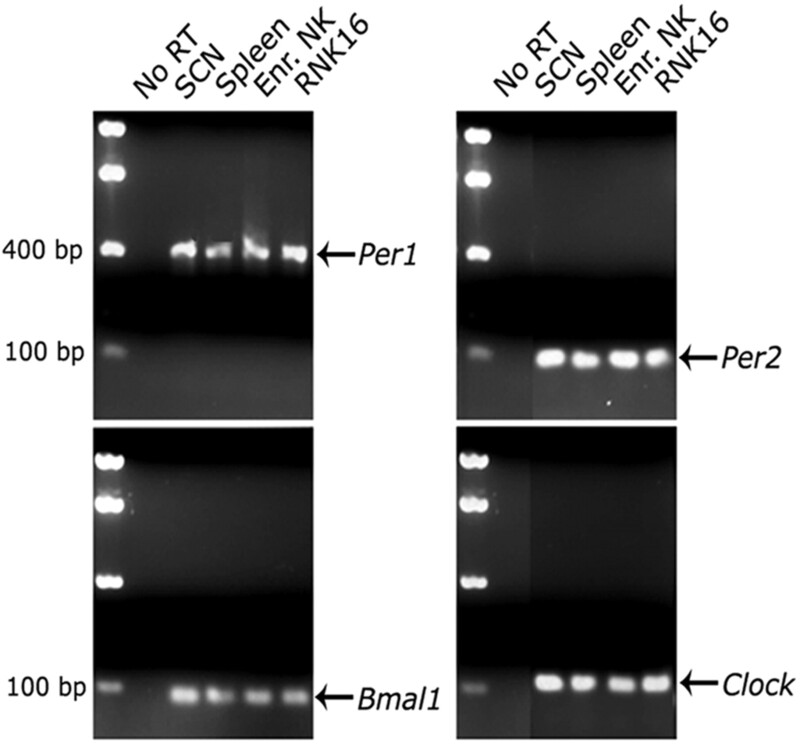 Circadian rhythms in CREB mRNA levels (A) and phosphorylated CREB (p-CREB) protein levels (B) detected in NK cells enriched from rat spleen at 6:00 a.m., 10:00 a.m., 2:00 p.m., 6:00 p.m., 10:00 p.m., and 2:00 a.m. These time points correspond with ZT 3, 7, 11, 15, 19, and 23, respectively. Total RNA from the enriched fraction was reverse transcribed to cDNA and then subjected to real-time PCR. Relative mRNA levels at each time point were determined as a percentage of the maximum value. Enriched fraction lysates were subjected to standard SDS-PAGE electrophoresis and blotting procedures. After densitometric quantitation, relative protein content at each time point was determined as a percentage of the maximum value. Data are mean ± SEM of four animals per time point. a, Significantly different (p at least <0.05) from the lowest value. The dark period (▪) in cycle is shown. Representative immunoblots are also shown. In this study we report for the first time the existence of clock gene oscillations in splenic-enriched NK cells. In addition, we demonstrate circadian expression of granzyme B, perforin, IFN-γ, and TNF-α, which emphasizes the circadian nature of NK cell function. We have used previously whole rat spleens to identify the mRNA and protein rhythms of granzyme B, perforin, and IFN-γ (25). In contrast, in this study we used enriched NK cells from rat spleens to analyze the rhythms of granzyme B, perforin, IFN-γ, and TNF-α. Other splenic lymphocytes can also express cytolytic factors and/or IFN-γ (CD8 lymphocytes, NKT cells, APCs, and others). Hence, a thorough study in an enriched NK cell population was mandatory because granzyme B, perforin, and IFN-γ rhythms coming from non-NK cell sources may mask, at least in part, the actual rhythms in the expression of cytolytic factors and IFN-γ in splenic NK cells. Although some differences exist when comparing the circadian patterns, both studies coincide in showing the highest mRNA levels of granzyme B, perforin, and IFN-γ during the light period and the highest protein levels of granzyme B, perforin, and IFN-γ during the dark period. The fact that the circadian rhythms in both mRNA and protein levels of granzyme B, perforin, and IFN-γ were found to be similar (±4 h shifts) in both enriched NK cells and in the spleen (25) leads to several conclusions: 1) these circadian rhythms are conserved and reproducible in rats, 2) NK cells and other splenocytes may share similar rhythms in the expression of granzyme B, perforin, and IFN-γ, or 3) the circadian nature of the cytolytic function may be exclusive of NK cells. Regarding the latest, it would be expected for innate immune mechanisms such as NK cell function to have developed a circadian regulation to optimize their activity when most needed. Perforin and granzymes have been largely recognized as fundamental components of the granule-mediated cytolytic activity (32). IFN-γ produced by NK cells acts as a self-activating molecule that promotes NK-cell-mediated killing (17). In this work we have included the circadian analysis of TNF-α, also relevant for NK cell function. TNF-α promotes NK-cell mediated killing (33) and there is direct evidence for its role as a cytotoxic molecule during the effector phase of the NK-mediated and lymphokine-activated killer-mediated antitumor cytolytic pathway (34). Interestingly enough, TNF-α rhythms in mRNA and protein matched with those found for cytolytic factors and IFN-γ. This finding further suggests a circadian coordination of the molecular logistic necessary to perform NK cell function. Indeed, granzyme B, perforin, and IFN-γ, all showed a significant peak in protein levels at ZT19, exactly when the peak in NK cell cytolytic activity in rat spleen has been recently reported (25). The circadian oscillations of cytolytic factors and cytokines may compose an anticipation mechanism that would allow NK cells to follow their physiological rhythm in cytolytic activity. Indeed, a disruption in the rhythm of NK cell cytolytic activity in ethanol-treated rats was correlated with alterations in the circadian rhythms of granzyme B, perforin, and IFN-γ (25). Recurrent evidences for circadian NK functionality point inescapably to the existence of molecular clock mechanisms within NK cells. In this study we demonstrate for the first time the expression of canonical components of the cellular clock in NK cells as well as their circadian oscillations in NK cells enriched from the rat spleen. Moreover, clock gene transcripts oscillate in enriched NK cells with many properties similar to those seen in other peripheral tissues: Per1 transcript peaks at the time of the light-dark transition (5, 35, 36). So does Per2, with a longer acrophase than Per1 (5, 10). Bmal1 runs near antiphase with Per genes (37) and Clock has been shown to oscillate in phase with Bmal1 in the heart (5) and in the liver (38). Finally, Dbp, a clock-controlled transcription factor, also showed a strong circadian oscillation. Dbp is thought to generate upstream signals for physiological processes under circadian regulation (39), as it has been proven for locomotor activity (40) and the expression of some liver enzymes (41). Moreover, the circadian rhythm of Dbp transcript levels matches with Per1 rhythm, as seen in other peripheral tissues (42, 43). Circadian oscillations of Dbp indicate ultimately that the NK cell clock is able to generate functional outputs. The aforementioned properties suggest all together the existence of functional molecular clock machinery in NK cells. In addition, antiphasic mRNA and protein rhythms in cytolytic factors and cytokines point to a negative feedback regulation, which is a hallmark of any oscillatory mechanism. Recent studies prove that circadian clock mechanisms are involved in key physiological processes such as glucose homeostasis (44), insulin secretion (39), prolactin secretion (45), and reproductive activity (46). Similarly, the results obtained in this study yield a possible connection between NK cell function and the molecular clock machinery. Per gene expression has been reported in human lymphocytes (47, 48). Furthermore, human Per1 gene daily variations have been shown to have a similar acrophase and peak in both PBMCs and peripheral polymorphonuclear cells (49). Oishi et al. (50) reported a circadian Per2 mRNA expression in rat peripheral mononuclear lymphocytes that peaks at the early dark phase (ZT14), in accordance to our results in enriched NK cells. Thus, the existence of molecular clock machinery may be conserved across different lymphocyte subsets and peripheral blood cells. Moreover, they may share common entrainment signals. In this sense, it is yet to be deciphered whether the SCN, the central circadian pacemaker, is involved in the entrainment of NK cell function, as well as the coordinating signals by which circadian information may be conveyed to NK cells and other lymphocytes. Rhythms in the number of circulating T cells persisted in rats with disrupted circadian outputs (51). Similarly, SCN ablation did not affect the 24-h rhythms in cell cycle phase distribution in bone marrow cells (52), suggesting that some rhythms in the immune system may be SCN-independent. It is known that circadian gene expression can be maintained in vitro (6, 53). Thus, some peripheral clocks may be able to independently generate circadian oscillations and this could be also the case for NK cells. Rather than a mere rhythm generator for the periphery, the SCN should be envisioned as a transducer for light entrainment. However, there are entrainment signals other than light that may be coordinating the rhythm in NK cell function and other immunological parameters. For example, feeding is an important ZT for peripheral clock gene expression (54), and interestingly enough, internal desynchronization produced by restricted feeding during the light period slowed down tumor progression in mice (55). Daily activity rhythms are also considered to act as entrainment cues for peripheral tissues (56) and may as well influence the molecular clock in NK cells. In addition, intrinsic immunological outputs such a cytokine secretion could function as entrainment factors for immune cells. Indeed, IL-6 has been shown to induce Per1 expression in vitro (57). Recent studies are presenting CREB itself as a key component of the molecular clock mechanism. CREB-dependent signaling regulates Per promoters (58), being regulation necessary for light-induced signaling and phase shifts in the SCN (2, 59). In addition, CREB activation was shown to be involved in the generation of circadian clock gene expression in rat fibroblasts (43), suggesting a role for the CRE/CREB pathway also in peripheral tissues. In contrast, it has been reported that CRE sequences are necessary and sufficient for transcriptional activation of the granzyme B promoter in immortalized T cell lines and primary T cells (60). Indeed, a decreased CREB phosphorylation was correlated with a decrease in granzyme B transcription in NK cells (61). CRE sequences are also found in the perforin promoter (62). In addition, CREB has been proven to modulate IFN-γ and TNF-α gene transcription in several systems (63, 64, 65, 66). We show in this study a temporal correlation between the peak in phosphorylated CREB levels and the peaks in transcript levels of cytolytic factors and cytokines. Therefore, the CRE/CREB pathway appears as a suggestive link between the NK cell clock and NK cell circadian function. Finally, the attention given by the scientific community to circadian-related pathology has been augmenting in the last few years (67). Circadian rhythms seem to be particularly relevant in cardiovascular diseases (68), immune responses (69), and cancer (70, 71). It has been shown in mice that chronic jet lag disrupts circadian gene expression and accelerates tumor growth (72). Similarly, a disruption of the molecular clock machinery by mutation of Per2 increases the susceptibility of mice to the development of tumors (73). Alterations in circadian NK cell function may underlie some of these circadian-related pathologies. For example, NK cell cytolytic activity is significantly reduced after partial sleep deprivation (74) and correlates with a faster progression of breast cancer metastases (28). Indeed, an increased incidence of breast cancer and colorectal cancer has been documented in women working during night shift hours (75, 76). However, further research will be necessary to unveil the plausible connection between the NK cell clock machinery and NK cell function. The information on the mechanisms orchestrating this interaction will be extremely helpful for the development of chronotherapeutic approaches, which are undergoing lately an extensive development, especially in cancer therapy (77). We thank Dr. J. P. Advis and Dr. C. P. Chen for providing SCN samples. We also thank Petra Pham and Theresa H. Choi from the Analytical Cytometry/Image Analysis Core Facility of the Environmental and Occupational Health Sciences Institute, Rutgers, The State University of New Jersey and Robert Wood Johnson Medical School, University of Medicine and Dentistry of New Jersey. ↵1 This work was supported by National Institutes of Health Grants AA00220 and AA12642. ↵3 Abbreviations used in this paper: ZT, Zeitgeber time; SCN, suprachiasmatic nucleus; CRE, cAMP response element. Ripperger, J. A., L. P. Shearman, S. M. Reppert, U. Schibler. 2000. CLOCK, an essential pacemaker component, controls expression of the circadian transcription factor DBP. Genes Dev. 14: 679-689. Gau, D., T. Lemberger, C. von Gall, O. Kretz, N. Le Minh, P. Gass, W. Schmid, U. Schibler, H. W. Korf, G. Schutz. 2002. Phosphorylation of CREB Ser142 regulates light-induced phase shifts of the circadian clock. Neuron 34: 245-253. Alvarez-Lopez, C., R. Cernuda-Cernuda, E. Alcorta, M. Alvarez-Viejo, J. Manuel Garcia-Fernandez. 2004. Altered endogenous activation of CREB in the suprachiasmatic nucleus of mice with retinal degeneration. Brain Res. 1024: 137-145. Reppert, S. M., D. R. Weaver. 2002. Coordination of circadian timing in mammals. Nature 418: 935-941. Young, M. E., P. Razeghi, H. Taegtmeyer. 2001. Clock genes in the heart: characterization and attenuation with hypertrophy. Circ. Res. 88: 1142-1150. Yoo, S. H., S. Yamazaki, P. L. Lowrey, K. Shimomura, C. H. Ko, E. D. Buhr, S. M. Siepka, H. K. Hong, W. J. Oh, O. J. Yoo, et al 2004. PERIOD2::LUCIFERASE real-time reporting of circadian dynamics reveals persistent circadian oscillations in mouse peripheral tissues. Proc. Natl. Acad. Sci. USA 101: 5339-5346. Sakamoto, K., T. Nagase, H. Fukui, K. Horikawa, T. Okada, H. Tanaka, K. Sato, Y. Miyake, O. Ohara, K. Kako, N. Ishida. 1998. Multitissue circadian expression of rat period homolog (rPer2) mRNA is governed by the mammalian circadian clock, the suprachiasmatic nucleus in the brain. J. Biol. Chem. 273: 27039-27042. Chen, Y. G., A. Mantalaris, P. Bourne, P. Keng, J. H. Wu. 2000. Expression of mPer1 and mPer2, two mammalian clock genes, in murine bone marrow. Biochem. Biophys. Res. Commun. 276: 724-728. Bittman, E. L., L. Doherty, L. Huang, A. Paroskie. 2003. Period gene expression in mouse endocrine tissues. Am. J. Physiol. Regul. Integr. Comp. Physiol. 285: R561-R569. Muhlbauer, E., S. Wolgast, U. Finckh, D. Peschke, E. Peschke. 2004. Indication of circadian oscillations in the rat pancreas. FEBS Lett. 564: 91-96. Lotzova, E.. 1989. Cytotoxicity and clinical application of activated NK cells. Med. Oncol. Tumor Pharmacother. 6: 93-98. Colucci, F., M. A. Caligiuri, J. P. Di Santo. 2003. What does it take to make a natural killer?. Nat. Rev. Immunol. 3: 413-425. Austin Taylor, M., M. Bennett, V. Kumar, J. D. Schatzle. 2000. Functional defects of NK cells treated with chloroquine mimic the lytic defects observed in perforin-deficient mice. J. Immunol. 165: 5048-5053. Street, S. E., E. Cretney, M. J. Smyth. 2001. Perforin and interferon-γ activities independently control tumor initiation, growth, and metastasis. Blood 97: 192-197. Cifone, M. G., S. D’Alo, R. Parroni, D. Millimaggi, L. Biordi, S. Martinotti, A. Santoni. 1999. Interleukin-2-activated rat natural killer cells express inducible nitric oxide synthase that contributes to cytotoxic function and interferon-γ production. Blood 93: 3876-3884. Papamichail, M., S. A. Perez, A. D. Gritzapis, C. N. Baxevanis. 2004. Natural killer lymphocytes: biology, development, and function. Cancer Immunol. Immunother. 53: 176-186. Roberts, J. E.. 2000. Light and immunomodulation. Ann. NY Acad. Sci. 917: 435-445. Chacón, F., P. Cano, S. Lopez-Varela, V. Jiménez, A. Marcos, A. I. Esquifino. 2002. Chronobiological features of the immune system: effect of calorie restriction. Eur. J. Clin. Nutr. 56:(Suppl. 3): S69-S72. Levi, F., C. Canon, M. Dipalma, I. Florentin, J. L. Misset. 1991. When should the immune clock be reset: from circadian pharmacodynamics to temporally optimized drug delivery. Ann. NY Acad. Sci. 618: 312-329. Fernandes, G., F. Carandente, E. Halberg, F. Halberg, R. A. Good. 1979. Circadian rhythm in activity of lympholytic natural killer cells from spleens of Fischer rats. J. Immunol. 123: 622-625. Esquifino, A. I., L. Selgas, A. Arce, V. D. Maggiore, D. P. Cardinali. 1996. Twenty-four-hour rhythms in immune responses in rat submaxillary lymph nodes and spleen: effect of cyclosporine. Brain Behav. Immun. 10: 92-102. Shakhar, G., I. Bar-Ziv, S. Ben-Eliyahu. 2001. Diurnal changes in lung tumor clearance and their relation to NK cell cytotoxicity in the blood and spleen. Int. J. Cancer 94: 401-406. Arjona, A., N. Boyadjieva, D. K. Sarkar. 2004. Circadian rhythms of granzyme B, perforin, IFN-γ, and NK cell cytolytic activity in the spleen: effects of chronic ethanol. J. Immunol. 172: 2811-2817. Bovbjerg, D. H.. 2003. Circadian disruption and cancer: sleep and immune regulation. Brain Behav. Immun. 17:(Suppl. 1): S48-S50. Fu, L., C. C. Lee. 2003. The circadian clock: pacemaker and tumour suppressor. Nat. Rev. Cancer 3: 350-361. Sephton, S. E., R. M. Sapolsky, H. C. Kraemer, D. Spiegel. 2000. Diurnal cortisol rhythm as a predictor of breast cancer survival. J. Natl. Cancer Inst. 92: 994-1000. Boyadjieva, N., M. Dokur, J. P. Advis, G. G. Meadows, D. K. Sarkar. 2001. Chronic ethanol inhibits NK cell cytolytic activity: role of opioid peptide β-endorphin. J. Immunol. 167: 5645-5652. Jiang, H., X. Yang, R. N. Soriano, T. Fujimura, K. Krishnan, M. Kobayashi. 2000. Distinct patterns of cytokine gene suppression by the equivalent effective doses of cyclosporine and tacrolimus in rat heart allografts. Immunobiology 202: 280-292. Raja, S. M., B. Wang, M. Dantuluri, U. R. Desai, B. Demeler, K. Spiegel, S. S. Metkar, C. J. Froelich. 2002. Cytotoxic cell granule-mediated apoptosis: characterization of the macromolecular complex of granzyme B with serglycin. J. Biol. Chem. 277: 49523-49530. Lee, R. K., J. Spielman, D. Y. Zhao, K. J. Olsen, E. R. Podack. 1996. Perforin, Fas ligand, and tumor necrosis factor are the major cytotoxic molecules used by lymphokine-activated killer cells. J. Immunol. 157: 1919-1925. Baxevanis, C. N., I. F. Voutsas, O. E. Tsitsilonis, M. L. Tsiatas, A. D. Gritzapis, M. Papamichail. 2000. Compromised anti-tumor responses in tumor necrosis factor-α knockout mice. Eur. J. Immunol. 30: 1957-1966. Oishi, K., H. Fukui, K. Sakamoto, K. Miyazaki, H. Kobayashi, N. Ishida. 2002. Differential expressions of mPer1 and mPer2 mRNAs under a skeleton photoperiod and a complete light-dark cycle. Brain Res. Mol. Brain Res. 109: 11-17. Iwasaki, T., K. Nakahama, M. Nagano, A. Fujioka, H. Ohyanagi, Y. Shigeyoshi. 2004. A partial hepatectomy results in altered expression of clock-related and cyclic glyceraldehyde 3-phosphate dehydrogenase (GAPDH) genes. Life Sci. 74: 3093-3102. Oishi, K., K. Sakamoto, T. Okada, T. Nagase, N. Ishida. 1998. Antiphase circadian expression between BMAL1 and period homologue mRNA in the suprachiasmatic nucleus and peripheral tissues of rats. Biochem. Biophys. Res. Commun. 253: 199-203. Preitner, N., F. Damiola, L. Lopez-Molina, J. Zakany, D. Duboule, U. Albrecht, U. Schibler. 2002. The orphan nuclear receptor REV-ERBα controls circadian transcription within the positive limb of the mammalian circadian oscillator. Cell 110: 251-260. Allaman-Pillet, N., R. Roduit, A. Oberson, S. Abdelli, J. Ruiz, J. S. Beckmann, D. F. Schorderet, C. Bonny. 2004. Circadian regulation of islet genes involved in insulin production and secretion. Mol. Cell. Endocrinol. 226: 59-66. Lopez-Molina, L., F. Conquet, M. Dubois-Dauphin, U. Schibler. 1997. The DBP gene is expressed according to a circadian rhythm in the suprachiasmatic nucleus and influences circadian behavior. EMBO J. 16: 6762-6771. Lavery, D. J., L. Lopez-Molina, R. Margueron, F. Fleury-Olela, F. Conquet, U. Schibler, C. Bonfils. 1999. Circadian expression of the steroid 15 α-hydroxylase (Cyp2a4) and coumarin 7-hydroxylase (Cyp2a5) genes in mouse liver is regulated by the PAR leucine zipper transcription factor DBP. Mol. Cell. Biol. 19: 6488-6499. Damiola, F., N. Le Minh, N. Preitner, B. Kornmann, F. Fleury-Olela, U. Schibler. 2000. Restricted feeding uncouples circadian oscillators in peripheral tissues from the central pacemaker in the suprachiasmatic nucleus. Genes Dev. 14: 2950-2961. Yagita, K., H. Okamura. 2000. Forskolin induces circadian gene expression of rPer1, rPer2 and dbp in mammalian rat-1 fibroblasts. FEBS Lett. 465: 79-82. Rudic, R. D., P. McNamara, A. M. Curtis, R. C. Boston, S. Panda, J. B. Hogenesch, G. A. Fitzgerald. 2004. BMAL1 and CLOCK, two essential components of the circadian clock, are involved in glucose homeostasis. PLoS Biol. 2: e377. Lincoln, G. A., H. Andersson, D. Hazlerigg. 2003. Clock genes and the long-term regulation of prolactin secretion: evidence for a photoperiod/circannual timer in the pars tuberalis. J. Neuroendocrinol. 15: 390-397. Chappell, P. E., R. S. White, P. L. Mellon. 2003. Circadian gene expression regulates pulsatile gonadotropin-releasing hormone (GnRH) secretory patterns in the hypothalamic GnRH-secreting GT1–7 cell line. J. Neurosci. 23: 11202-11213. Takata, M., N. Burioka, S. Ohdo, H. Takane, H. Terazono, M. Miyata, T. Sako, H. Suyama, Y. Fukuoka, K. Tomita, E. Shimizu. 2002. Daily expression of mRNAs for the mammalian Clock genes Per2 and Clock in mouse suprachiasmatic nuclei and liver and human peripheral blood mononuclear cells. Jpn. J. Pharmacol. 90: 263-269. Boivin, D. B., F. O. James, A. Wu, P. F. Cho-Park, H. Xiong, Z. S. Sun. 2003. Circadian clock genes oscillate in human peripheral blood mononuclear cells. Blood 102: 4143-4145. Kusanagi, H., K. Mishima, K. Satoh, M. Echizenya, T. Katoh, T. Shimizu. 2004. Similar profiles in human period1 gene expression in peripheral mononuclear and polymorphonuclear cells. Neurosci. Lett. 365: 124-127. Oishi, K., K. Sakamoto, T. Okada, T. Nagase, N. Ishida. 1998. Humoral signals mediate the circadian expression of rat period homologue (rPer2) mRNA in peripheral tissues. Neurosci. Lett. 256: 117-119. Depres-Brummer, P., P. Bourin, N. Pages, G. Metzger, F. Levi. 1997. Persistent T lymphocyte rhythms despite suppressed circadian clock outputs in rats. Am. J. Physiol. 273: R1891-R1899. Filipski, E., V. M. King, M. C. Etienne, X. Li, B. Claustrat, T. G. Granda, G. Milano, M. H. Hastings, F. Levi. 2004. Persistent twenty-four hour changes in liver and bone marrow despite suprachiasmatic nuclei ablation in mice. Am. J. Physiol. Regul. Integr. Comp. Physiol. 287: R844-R851. Balsalobre, A., L. Marcacci, U. Schibler. 2000. Multiple signaling pathways elicit circadian gene expression in cultured Rat-1 fibroblasts. Curr. Biol. 10: 1291-1294. Kobayashi, H., K. Oishi, S. Hanai, N. Ishida. 2004. Effect of feeding on peripheral circadian rhythms and behaviour in mammals. Genes Cells 9: 857-864. Wu, M. W., X. M. Li, L. J. Xian, F. Levi. 2004. Effects of meal timing on tumor progression in mice. Life Sci. 75: 1181-1193. Schibler, U., J. Ripperger, S. A. Brown. 2003. Peripheral circadian oscillators in mammals: time and food. J. Biol. Rhythms 18: 250-260. Motzkus, D., U. Albrecht, E. Maronde. 2002. The human PER1 gene is inducible by interleukin-6. J. Mol. Neurosci. 18: 105-109. Travnickova-Bendova, Z., N. Cermakian, S. M. Reppert, P. Sassone-Corsi. 2002. Bimodal regulation of mPeriod promoters by CREB-dependent signaling and CLOCK/BMAL1 activity. Proc. Natl. Acad. Sci. USA 99: 7728-7733. Tischkau, S. A., J. W. Mitchell, S. H. Tyan, G. F. Buchanan, M. U. Gillette. 2003. Ca2+/cAMP response element-binding protein (CREB)-dependent activation of Per1 is required for light-induced signaling in the suprachiasmatic nucleus circadian clock. J. Biol. Chem. 278: 718-723. Babichuk, C. K., B. L. Duggan, R. C. Bleackley. 1996. In vivo regulation of murine granzyme B gene transcription in activated primary T cells. J. Biol. Chem. 271: 16485-16493. Thomas, L. D., H. Shah, S. A. Green, A. D. Bankhurst, M. M. Whalen. 2004. Tributyltin exposure causes decreased granzyme B and perforin levels in human natural killer cells. Toxicology 200: 221-233. Youn, B. S., C. C. Liu, K. K. Kim, J. D. Young, M. H. Kwon, B. S. Kwon. 1991. Structure of the mouse pore-forming protein (perforin) gene: analysis of transcription initiation site, 5′ flanking sequence, and alternative splicing of 5′ untranslated regions. J. Exp. Med. 173: 813-822. Cippitelli, M., A. Sica, V. Viggiano, J. Ye, P. Ghosh, M. J. Birrer, H. A. Young. 1995. Negative transcriptional regulation of the interferon-γ promoter by glucocorticoids and dominant negative mutants of c-Jun. J. Biol. Chem. 270: 12548-12556. Penix, L. A., M. T. Sweetser, W. M. Weaver, J. P. Hoeffler, T. K. Kerppola, C. B. Wilson. 1996. The proximal regulatory element of the interferon-γ promoter mediates selective expression in T cells. J. Biol. Chem. 271: 31964-31972. Becker, C., K. Barbulescu, S. Wirtz, K. H. Meyer zum Buschenfelde, S. Pettersson, M. F. Neurath. 1999. Constitutive and inducible in vivo protein-DNA interactions at the tumor necrosis factor-α promoter in primary human T lymphocytes. Gene Expr. 8: 115-127. Chong, Y. H., Y. J. Shin, Y. H. Suh. 2003. Cyclic AMP inhibition of tumor necrosis factor α production induced by amyloidogenic C-terminal peptide of Alzheimer’s amyloid precursor protein in macrophages: involvement of multiple intracellular pathways and cyclic AMP response element binding protein. Mol. Pharmacol. 63: 690-698. Hastings, M. H., A. B. Reddy, E. S. Maywood. 2003. A clockwork web: circadian timing in brain and periphery, in health and disease. Nat. Rev. Neurosci. 4: 649-661. Casetta, I., E. Granieri, F. Portaluppi, R. Manfredini. 2002. Circadian variability in hemorrhagic stroke. J. Am. Med. Assoc. 287: 1266-1267. Uthgenannt, D., D. Schoolmann, R. Pietrowsky, H. L. Fehm, J. Born. 1995. Effects of sleep on the production of cytokines in humans. Psychosom. Med. 57: 97-104. Schernhammer, E. S., K. Schulmeister. 2004. Melatonin and cancer risk: does light at night compromise physiologic cancer protection by lowering serum melatonin levels?. Br. J. Cancer 90: 941-943. Stevens, R. G.. 2005. Circadian disruption and breast cancer: from melatonin to clock genes. Epidemiology 16: 254-258. Filipski, E., F. Delaunay, V. M. King, M. W. Wu, B. Claustrat, A. Grechez-Cassiau, C. Guettier, M. H. Hastings, L. Francis. 2004. Effects of chronic jet lag on tumor progression in mice. Cancer Res. 64: 7879-7885. Fu, L., H. Pelicano, J. Liu, P. Huang, C. Lee. 2002. The circadian gene Period2 plays an important role in tumor suppression and DNA damage response in vivo. Cell 111: 41-50. Irwin, M., A. Mascovich, J. C. Gillin, R. Willoughby, J. Pike, T. L. Smith. 1994. Partial sleep deprivation reduces natural killer cell activity in humans. Psychosom. Med. 56: 493-498. Schernhammer, E. S., F. Laden, F. E. Speizer, W. C. Willett, D. J. Hunter, I. Kawachi, C. S. Fuchs, G. A. Colditz. 2003. Night-shift work and risk of colorectal cancer in the nurses’ health study. J. Natl. Cancer Inst. 95: 825-828. Hansen, J.. 2001. Increased breast cancer risk among women who work predominantly at night. Epidemiology 12: 74-77. Mormont, M. C., F. Levi. 2003. Cancer chronotherapy: principles, applications, and perspectives. Cancer 97: 155-169.